What 132 schoolchildren should teach us. December 17, 2014 8:26 am / 1 Comment on What 132 schoolchildren should teach us. Two recent newspaper articles have been very troubling; one of them positively horrific. One hundred and forty-one people died, all but 9 of them children, in a Taliban attack on a school in Pakistan. The picture below appeared on an online news site nearly two months ago. An Indian love story that could be the beginning of a fairy tale. She is 21, a Muslim, a student at a dental college. He is 24, an engineer, a non-practicing Hindu. They fell in love. Her parents had planned an arranged marriage for her. She did not want it. So Anshida secretly married the man she loved. And they lived happily ever after. Oops, no! Apparently there are enough people in her community willing to resort to violence in order to prevent inter-racial unions, and this couple has been forced to live under police protection ever since. 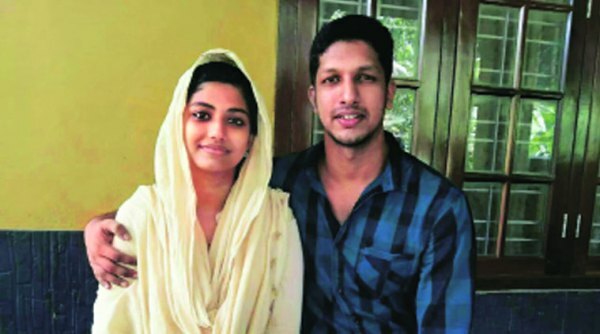 Here is a link to an interview with the couple where Gautham says their only desire is to live in peace together and they might have to leave the country to do so. Anshida and Gautham, in the Indian Express Nation online edition of November 12, 2014. Einstein was apparently once asked to explain how radio worked and famously used the example of a long cat. You see, wire telegraph is a kind of a very, very long cat. You pull his tail in New York and his head is meowing in Los Angeles. Do you understand this? And radio operates exactly the same way: you send signals here, they receive them there. The only difference is that there is no cat. The explanation is not so simplistic as it sounds, since nerve impulses are also electrical impulses of a different kind. Now what has this got to do with the persecution of a loving young couple (don’t tell me there’s something wrong with love) and murder of 132 schoolchildren by religious fanatics? 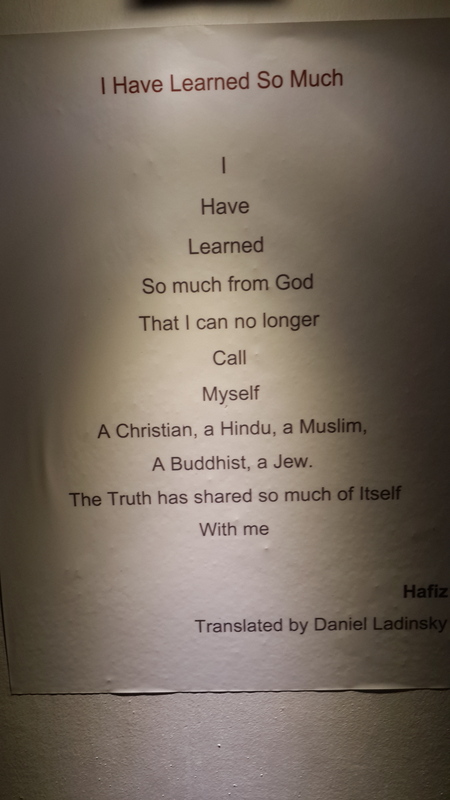 Growing up in the south of India, I experienced Islam as a very benevolent religion of deep faith anchored in tolerance as epitomised by the work of Rumi and Hafez. I saw the following quote taken from the wall of a recently demolished house. When I came across the apocryphal tale of Einstein’s explanation of how radio works, I realised that Islamic fundamentalist theologians have taken a step backwards in the 20th century and invented a real cat to interpret the gap between scripture and practice. And indeed, it is a cat that squeals horribly. I much prefer the Einsteinian version of an imaginary cat. Counter-progressive theologians have not yet disputed the efficacy of radio transmission without cats. I long for them to do the same in the case of the transmission and observance of religious beliefs. It is to be hoped that the murder of 132 children moves at least some of them to re-examine the dead certainties of their religious beliefs. The story of oil begins more than 2,500 years ago. Reliable indicators show that in China people were drilling a mile deep with bamboo pipes to recover natural gas and liquid hydrocarbons that were used as a source of fuel for fires. This was before the start of the Han dynasty in 400 BC. See this fascinating slide presentation on the progress of drilling technology by Allen Castleman, a self-confessed oil redneck. The modern oil age is popularly considered to have started in the 19th century with the use of internal combustion engines for everything from pumping water to transportation. A glorious age, but now it’s time to move on (pun intended) to other fuels. As Saudi oil minister Sheikh Zaki Yamani predicted more than three decades ago, “the Stone Age did not end for lack of stones, and the Oil Age will end long before the world runs out of oil;” a statement at once prescient, rueful and flippant. In today’s lugubrious world, they don’t make oil ministers like that any more. As a reminder that the world turns and turns and comes full circle in more ways than one, here’s a parting thought; an article from the Guardian of 30 January 2014. 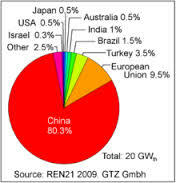 In 2013 alone, China installed more solar power than the entire installed capacity in the US, the country where the technology was invented. 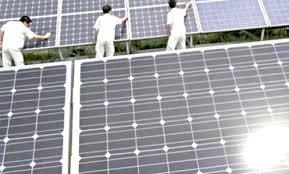 There is a caveat to the article that some of this newly installed capacity is not yet connected to the grid but, once installed, connections are only a matter of time.